A small kiln for baking clay figures may be built at a cost of $1. 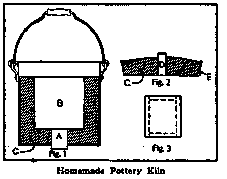 The following shows the general plan of such a kiln which has stood the test of 200 firings, and which is good for any work requiring less than 1400° C.
Get an iron pail about 1 ft. high by 1 ft. across, with a cover. Any old pail which is thick enough will do, while a new one will cost about 80 cents. In the bottom of this cut a 2-in. round hole and close it with a cork or wood plug, A, Fig. 1, which shall project at least 2 in. inside the pail. Make a cylindrical core of wood, B, Fig. 1, 8 in. long and 8 in. across. Make a mixture of clay, 60%; sand, 15%; and graphite, 25%, kneading thoroughly in water to a good molding consistency. Line the pail, bottom and sides, with heavy paper and cover the core with same. Now pack the bottom of the pail thoroughly with a 2-in. layer of the clay mixture, and on it set the paper wrapped core, carefully centering it. The 2 in. of space between the core and the sides of the pail all around is to be filled with clay, C, as is shown in the sketch, using a little at a time and packing it very tight. In like manner make the cover of the kiln, cutting the hole a little smaller, about 1 in. 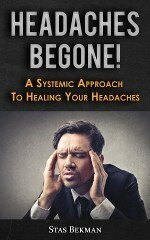 At the edge or rim of the cover encircle a 2-in. strip of sheet iron, E, Fig. 2, to hold the clay mixture, C. Set aside for a few days until well dried. While these are drying you may be making a muffle, if there is to be any glazing done. This is a clay cylinder (Fig. 3) with false top and bottom, in which the pottery to be glazed is protected from any smoke or dust. It is placed inside the kiln, setting on any convenient blocks which will place it midway. The walls of the muffle should be about 1/2 in. thick, and the dimensions should allow at least 1 in. of space all around for the passage of heat between it and the walls of the kiln. By the time the clay of the kiln is well dried, it will be found that it has all shrunk away from the iron about 3/8 in. After removing all the paper, pack this space-top, bottom and sides-with moist ground asbestos. If the cover of the pail has no rim, it may be fastened to the asbestos and clay lining by punching a few holes, passing wire nails through and clinching . Fit all the parts together snugly, take out the plugs in the top and bottom, and your kiln is ready for business. The handle of the pail will be convenient for moving it about, and it can be set on three bricks or some more elaborate support, as dictated by fancy and expense. The temperature required for baking earthenware is 1250°-1310°, C.,; hotel china, 1330°; hard porcelain, 1390°-1410°. These temperatures can not be obtained in the above kiln by means of the ordinary Bunsen burner. If will be necessary either to buy the largest size Bunsen, or make one yourself, if you have the materials. If you can get a cone which can be screwed into an inch pipe, file the opening of the cone to 1/16 in. diameter, and jacket the whole with a 2-1/2-in. pipe. The flame end of this burner tube should be about 4-1/2 in. above the cone opening and should be covered with gauze to prevent flame from snapping back. When lighted, the point of the blue flame, which is the hottest part, should be just in the hole in the bottom of the kiln. Such a burner will be cheaply made and will furnish a kiln temperature of 1400 degrees, but it will burn a great deal of gas. A plumber's torch of medium size will cost more in the beginning, but will be cheaper in operation. Whatever burner is used, the firing should be gradual, and with especial caution the first time. By experiment you will find that a higher temperature is obtained by placing a 1-in. pipe 2-ft. long over the lid hole as a chimney. It would be still more effective to get another iron pail, 2 in. wider than the kiln, and get a down draft by inverting it over the kiln at whatever height proves most suitable.-G. L. W.